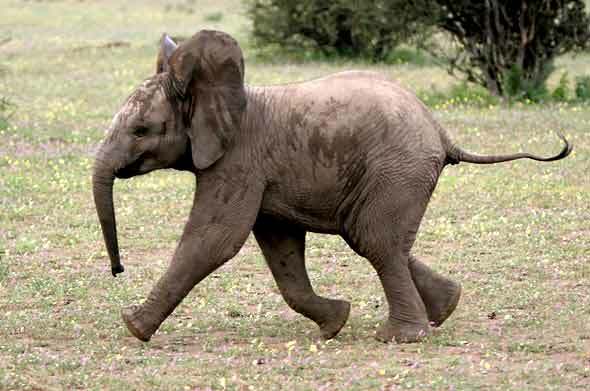 Photo Details: This baby elephant (Loxodonta africana), on realising it had become separated from its mother, quickly got into full stride as it ran back to join its mother and the other adults. Camera: Canon EOS 400D; Lens: Canon 80-200 F2.8 Zoom; Focal Length: 127mm; Shutter speed: 1/1250; Aperture: f2.8; ISO: 400. Photo Details: Nyala Bull (Tragelaphus angasii) lifts its head to check for danger while drinking from waterhole, Mkuze Game Reserve, KwaZulu-Natal, South Africa. Camera: Canon EOS 400D; Lens: Canon EOS 70-300 IS Zoom; Focal Length: 300mm; Shutter speed: 1/250; Aperture: f8; ISO: 400. 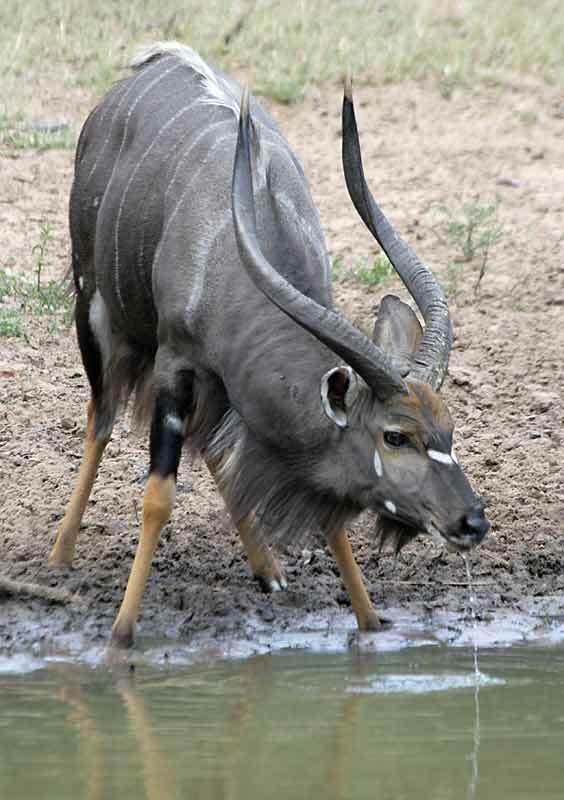 Additional Info: Antelope are particularly vulnerable to attack when they bend forward to drink from a pan or waterhole - both their field of view and escape routes are restricted, while their body posture means it's difficult to make a quick getaway. If there are crocodiles in the water, the danger is magnified. So it's not suprising that antelope - and other mammals that are the target of predators - are extremely nervous and skittish when drinking, constantly looking up and often shying away before returning to the water's edge..
Photo Details: White Rhinoceros (Ceratotherium simum), its coat encrusted with dried red mud, looks up briefly while grazing on a patch of short grass in the Pongola Nature Reserve, KwaZulu-Natal, South Africa. 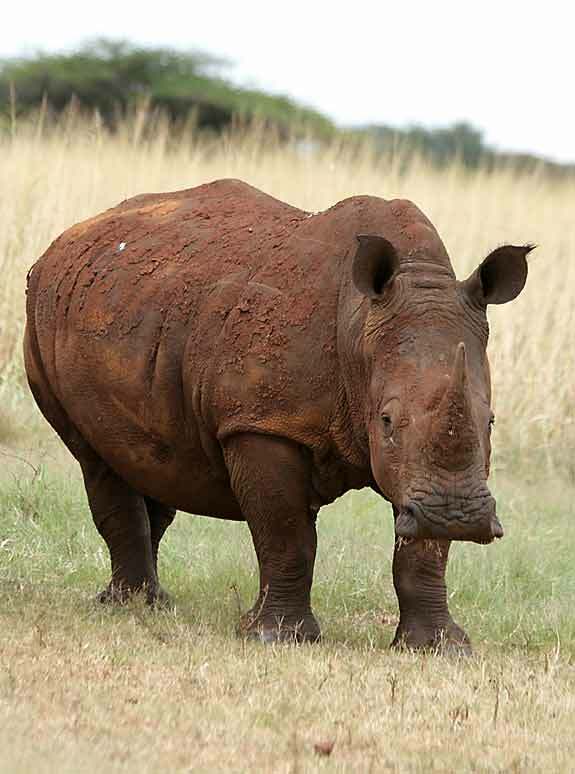 The square lip, a distinguishing characteristic of white rhino, can be clearly seen. The smaller black rhino - primarily a browser - has a pointed or hooked upper lip that allows it to grasp food from shrubs and small trees. Camera: Canon EOS 400D; Lens: Canon EOS 70-300 IS Zoom; Focal Length: 170mm; Shutter speed: 1/640; Aperture: f5; ISO: 400. Please Note: Pictures displayed on this blog are copyright protected. View them online, enjoy them, but kindly do not use them for anything else. Should you wish to purchase an image or require clarification on use, please contact me.